"As you know, House Rule 75 requires that, 'Members shall not be permitted to vote upon any question in which they are immediately or directly interested,'" Shouldice wrote. "Yet, Representative McCarthy did vote on H. 702. 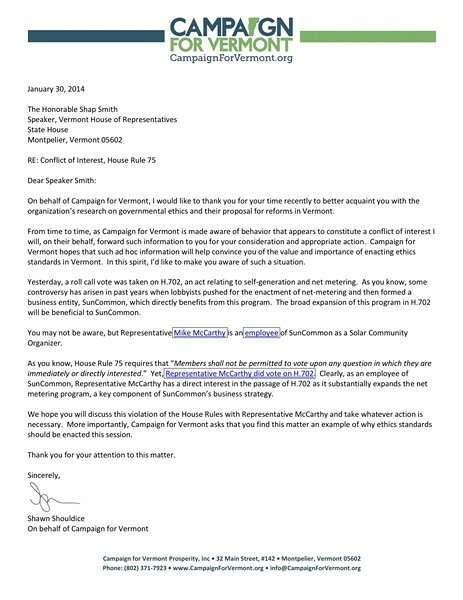 Clearly, as an employee of SunCommon, Representative McCarthy has a direct interest in the passage of H.702 as it substantially expands the net metering program, a key component of SunCommon's business strategy." Shouldice called on Smith to "discuss this violation" of House rules with McCarthy "and take whatever action is necessary." Smith says he doesn't plan to. "I think as long as people know he works for SunCommon, they can make their own judgment," Smith says. "But I don't think that he was doing something that would implicate Rule 75." That rule, Smith says, "really goes to the question of, 'Do you have a direct financial interest in the bill?' And I don't think that votes on issues that might affect your employer creates that direct financial interest." "We've got a citizen legislature," says McCarthy, who went to work for SunCommon in July 2013. "Farmers vote on farm bills. Teachers vote on education bills. We have a doctor who votes on health care bills. That's part of what makes the state kind of special." As to whether his vote constituted a conflict, McCarthy says it didn't. "My constituents know that I work at SunCommon," he says. "I haven't hidden that from anyone. I'm really excited that the support for the net-metering bill was so overwhelming." After Lisman unveiled his ethics reform proposals in early January, Smith appointed a working group to study the matter. He says the group's discussions are ongoing and its members might propose changes to House rules. He says he also plans to bring the matter of McCarthy's vote to his caucus leadership and to the House rules committee. But Smith says he doesn't want to go too far and disqualify ordinary Vermonters from serving in the legislature — and voting on the issues before them. "The fact of the matter is that in a citizen legislature, you're going to have people who have other employment. And issues in front of the legislature are going to impact their employment — or impact the business they're in," he says. "It's unavoidable. And if we're going to disqualify people from voting on things that they may be involved with because they work, I think we're going down the wrong path." This post was updated Friday at 5:40 p.m.